Wax Stacks will be making its debut appearance at Rocky Mountain Audio Fest this year. I guess I can only say that this is truly fitting. Colorado is close to home for Wax Stacks and we couldn’t be prouder to show off our American made crates at one of the best American hi-fi shows. Wanna get hands on with some crates ? 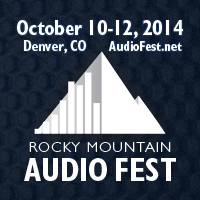 Come see us at RMAF in Denver Oct 10-12. Our friends at Zu Audio will have a wall of wax in the Pikes Peak ballroom. You just might find a few more of our crates scattered around the show if you’re looking. We had a great showing at the 2014 Rocky Mountain Audio Fest (2014 RMAF) in Zu Audio/Peachtree Audio’s room (Pike’s Peak Ballroom). They built a Wall of Wax showcasing our Wax Stacks record crates filled with some vinyl and their cool Cube speakers. The show was a great success for us. Thanks everyone. Think one crate is great? How about a whole wall of wax stacks?